There is a photo going around on the internet that shows a pack of wolves trekking through the wilderness. The view is taken from an airplane, so you can see the entire pack as it makes its way through the frozen, wintry forest path. In the lead are three elderly wolves walking together. Next come a larger group of strong hunters. They are there to protect the elderly and watch that they aren’t attacked from the sides. In the middle are weaker hunters, those that aren’t old but they’re not as limber as the others. They are followed by another strong group, again watching out for those less capable. 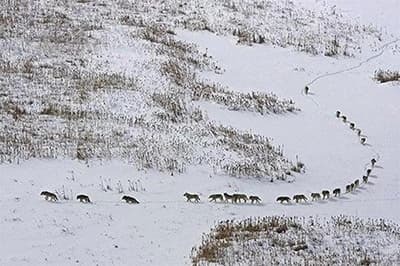 The very last wolf in the line is the pack leader. He is following behind, ever vigilant, ever watchful – making sure the entire pack makes the journey safely, together. This vision of the wolf pack leader is very much like the type of leadership we have here at Kenosha Human Development Services (KHDS). At KHDS, our leadership has always been able to choose individuals who work as a team, using their unique talents to serve our community. They trust those individuals to provide quality service and allow them to grow within their roles. They also encourage them to try new roles within the organization and, sometimes, to test their wings outside of our walls. Through it all, our group of Division Directors and, more importantly our Assistant Director and Executive Director lead by example. They’ve done the work. They know the programs and they understand the complexities of how it all comes together. Yet they follow behind like the wolf pack leader, allowing the workers to do what they need to do to get their jobs done while they are keeping an eye out for all of us. It’s an enormous responsibility – being an effective leader. KHDS is lucky that so many of our best leaders have been brought up through the ranks and nurtured by those great leaders from our past. That is part of the KHDS culture that will never change. We are a big/little agency with heart. One that not only works with passion for the community we live in, but with love for those we work with. That care extends from the oldest member of our staff to the newest, those with the most experience to those still learning. Through it all our Leadership is there, following, teaching, encouraging, and watching out for all of us in the best possible way.